This recipe is all kinds of awesome. Not only does it take less than 10 minutes to make but it combines my love of donuts and quest. These healthified "pronuts" make the perfect breakfast treat, snack, or dessert! Combine all dry ingredients and mix well. Add in wet ingredients. Start with 1/2 cup pumpkin then slowly add in more as needed until a dough forms. 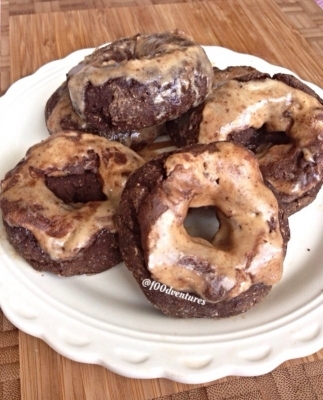 Pinch off pieces of dough, form into a donut shape, and arrange on an oiled plate. Make sure to spread them out so they cook evenly. Microwave 2-3 minutes until cooked all the way through. Set aside.